Thanks to PLAID Mod Podge for sponsoring this post. Although I received compensation for my work, the ideas presented here are entirely my own. 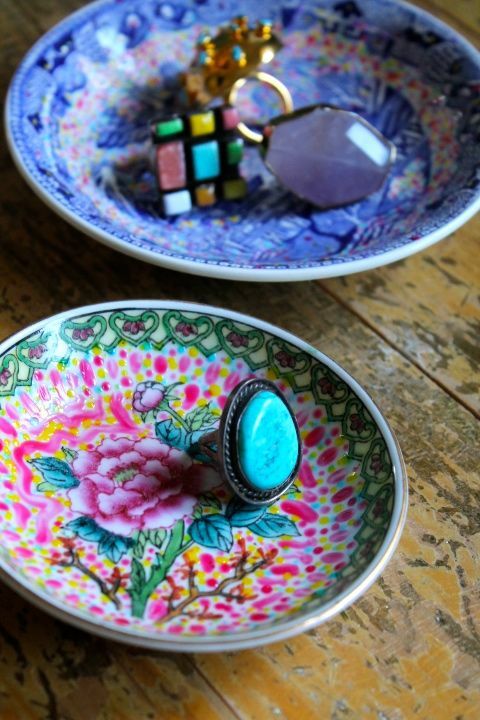 DIY Ring Catchers – for a few dollars, I picked up some small dishes from a resale shop and gave them a shot of color and new life with PLAID Mod Podge Sheer Colors. 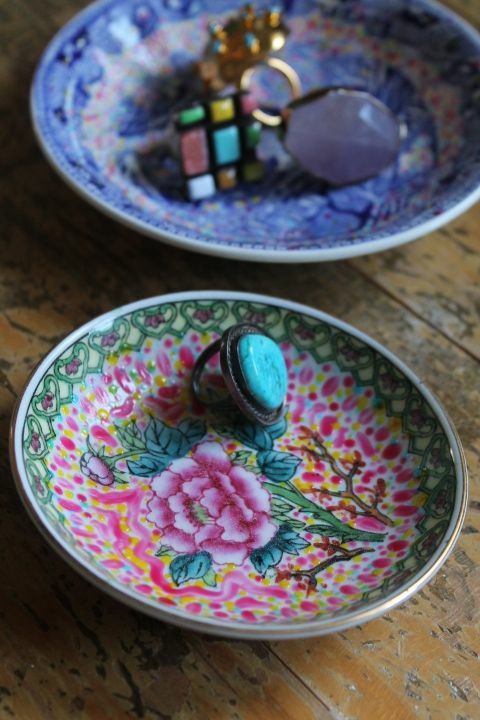 A fun little catchall dish for the desk or bedside to keep things organized. For this project I used: PLAID Mod Podge Sheer Colors (available at Michaels and on PLAID's website), a thin brush and a few small dishes from a resale shop. 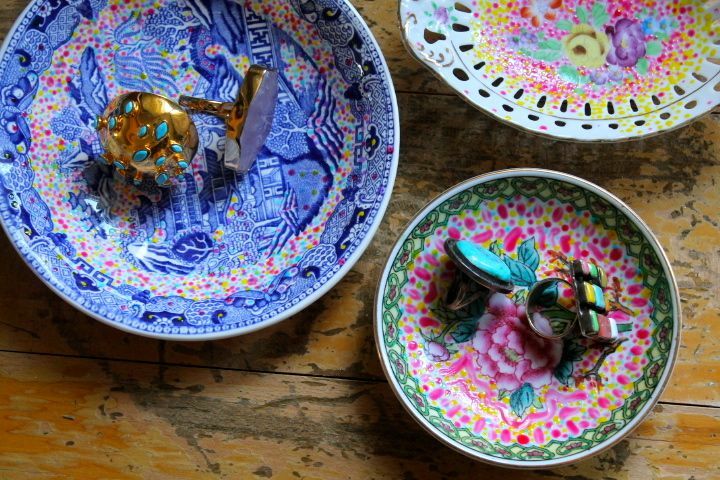 Start out by washing and drying your resale find. Using a fine brush, add your PLAID Mod Podge Sheer Colors. 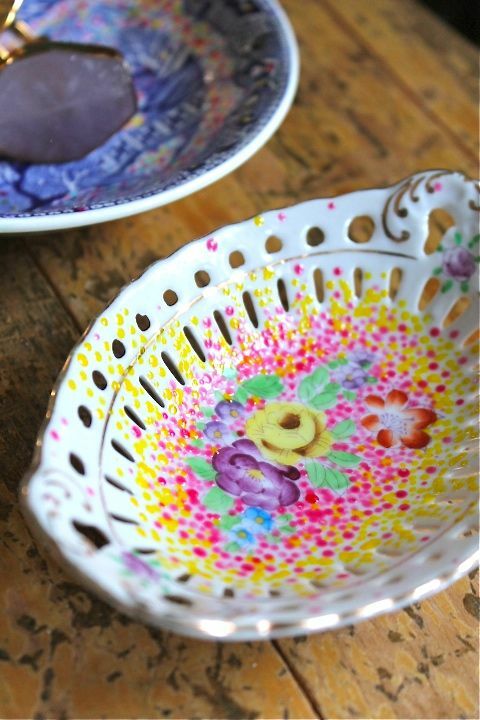 I chose to apply my color in dots of varied sizes and colors to the blank spaces of the dish's design. 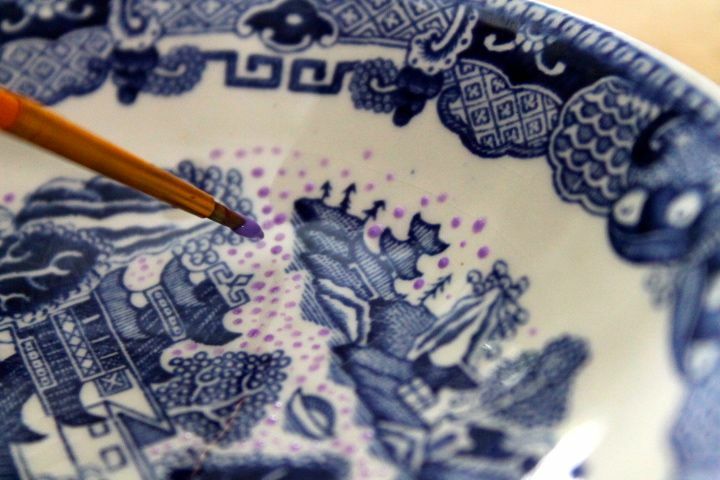 Apply first color and allow paint to dry for a few minutes before adding your next color. Mod Podge Sheer Colors worked so well for this project — its sheerness allowed me to layer my colors as well as vary intensity of color by using more or fewer layers. The effect adds a unique and modern look to china. PLAID Mod Podge Sheer Colors come in 9 bright and cheery colors — just the thing to add some intensity and freshness to older pieces. You can apply PLAID Mod Podge Sheer Colors with brush strokes or by swirling the paint over the surface of your item (as you would with a Mason jar). 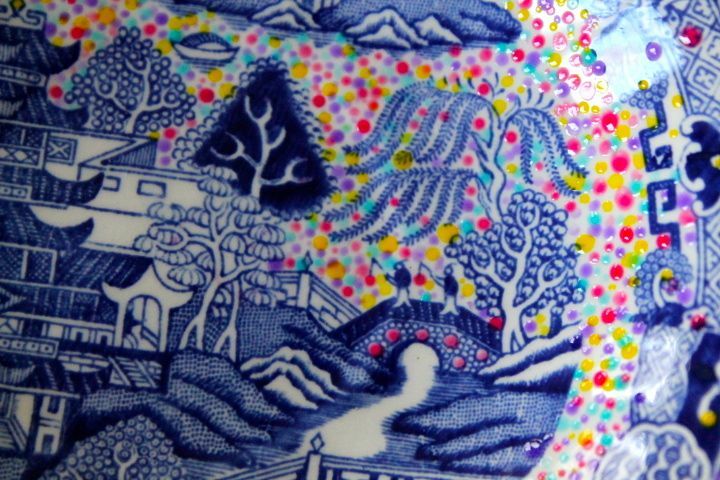 I really like the effect I was able to get by dotting on the paint with a fine brush – it looks like an interesting textured glaze. This would make a nice gift too – easy for kids and adults to make for Valentine's Day. 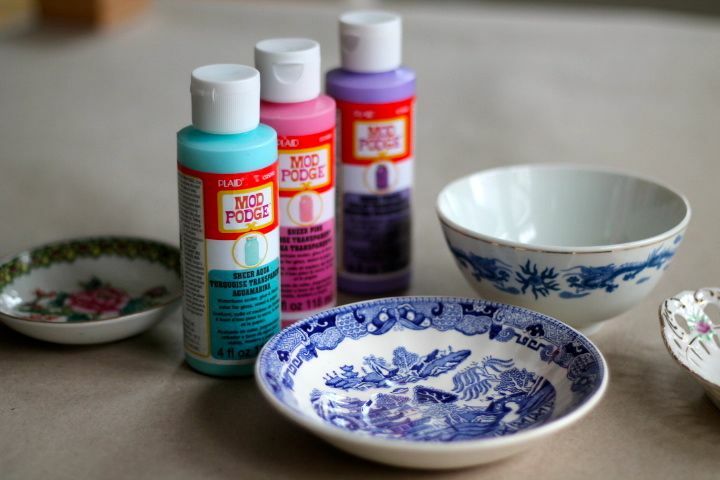 Mod Podge Sheer Color is a water based sealer, glue and finish color for glass, wood, metal and paper (it’s Mod Podge – in color!). 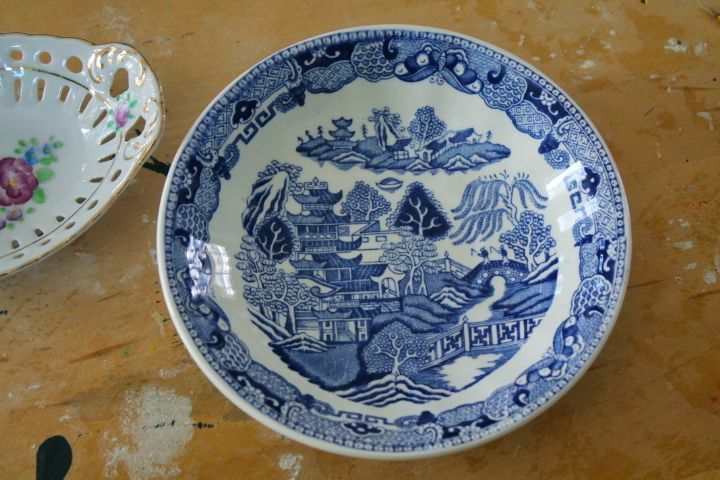 I chose to use it on china and it worked great — I got the exact effect that I wanted. If you’d like to see how to use this product to tint glass (Mason jars work really well for this) check out their online tutorial and learn more about how to use Mod Podge Sheer Colors here. 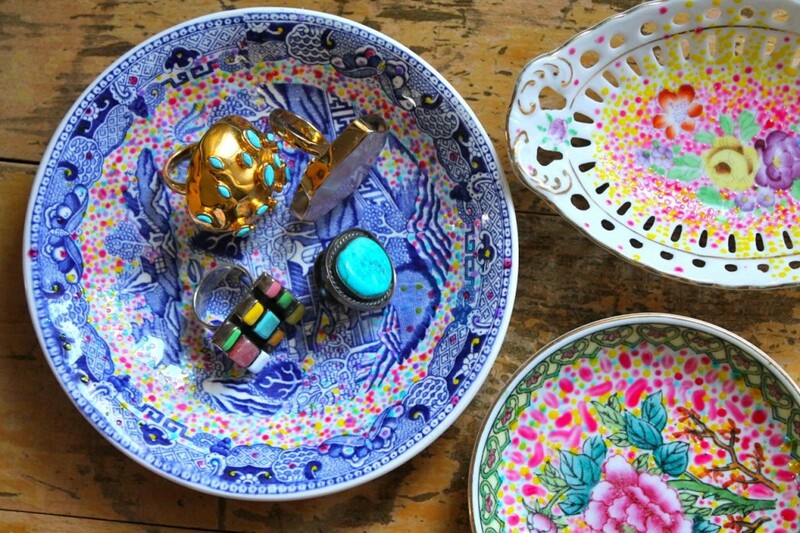 You can purchase PLAID Mod Podge Sheer Colors as well as their new Facet Shapes and Dishwasher Safe Mod Podge at Michaels and at PLAID online. Keep up to date with the latest trends in crafting by signing up for PLAID’s weekly newsletters and following PLAID on Pinterest! These are beautiful! 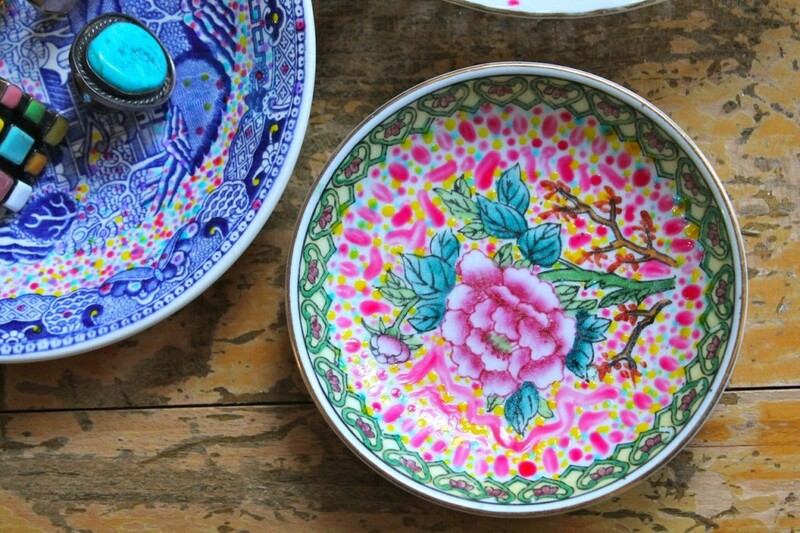 I’ve used paint (pens) on ceramics before but never thought to decorate dishes with existing designs. Lovely result. These are electric. Love the idea and you really nailed the execution. So creative! I love the transformation of the last dish pictured!